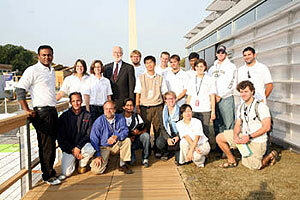 Georgia Institute of Technology students and faculty advisors gather for a team photo beside their 2007 Solar Decathlon house. In October 2007, teams from colleges and universities from the United States, Puerto Rico, Canada, Spain, and Germany competed in the third Solar Decathlon. Equal parts high-tech home show, nail-biting competition, unparalleled learning experience, and huge celebration, the 2007 Solar Decathlon crowned the Technische Universität Darmstadt the overall winner. The University of Maryland placed second and Santa Clara University came in third.